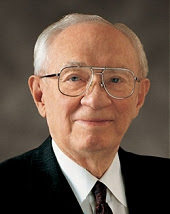 Gordon B. Hinckley, 15th president of the Church of Jesus Christ of Latter-day Saints died tonight at 7 pm MST from causes incident to age. He died in his apartment overlooking the historic Salt Lake Temple with family members at his side. Hinckley presided over the church of about 13 million members for almost 13 years. One of Hinckley's lasting accomplishments will be the great expansion of temples during his presidency. On 12-March-1995 when he became president, the Church had 47 operating temples. Today there are 124 with another 12 in various stages of construction. New FamilySearch owes some of its existence to Hinckley's insistence that tools be developed to further genealogy work among Church members, allowing collaboration and preventing duplicate submissions of ancestor names to the Church's temples.